We are looking for helpers next week. Please click either link if you available. We really appreciate your support! Come along and enjoy some play time with your family and take part in some activities including rounders, tig games and art with nature. Come along to any of the sessions, enjoy the outdoors and have some fun! You are invited to an event on the 24th April in Barrhead High School at 6.00pm to 8.00pm. Along with Police Scotland, we would like to chat to you about Auchenback and how we can work together to perhaps set up some groups for example cookery programmes or places to play and address any issues identified. As a community member of Auchenback your views about the area are valuable and we are keen to hear them. Huge congratulations to James’ success in the John Byrne National Drawing Competition. 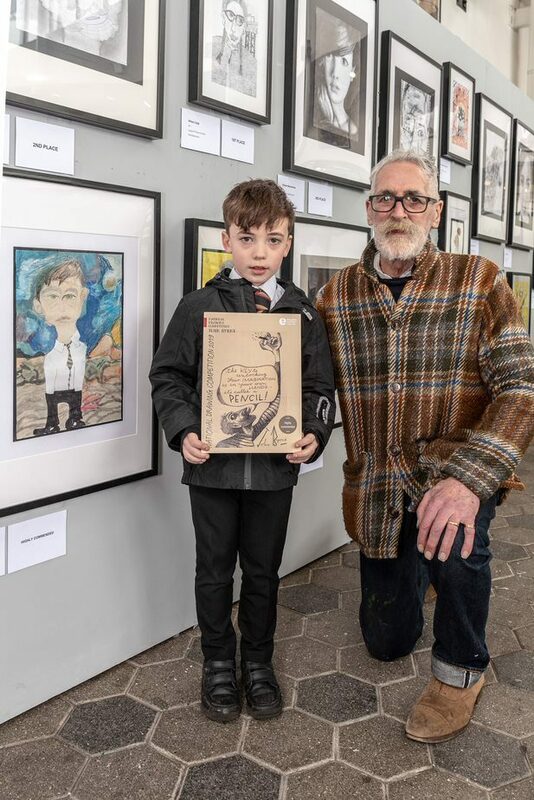 From over 7000 entries, James has done extremely well to be one of the winners and will have his drawing exhibited at the Tannahill Centre in Paisley. 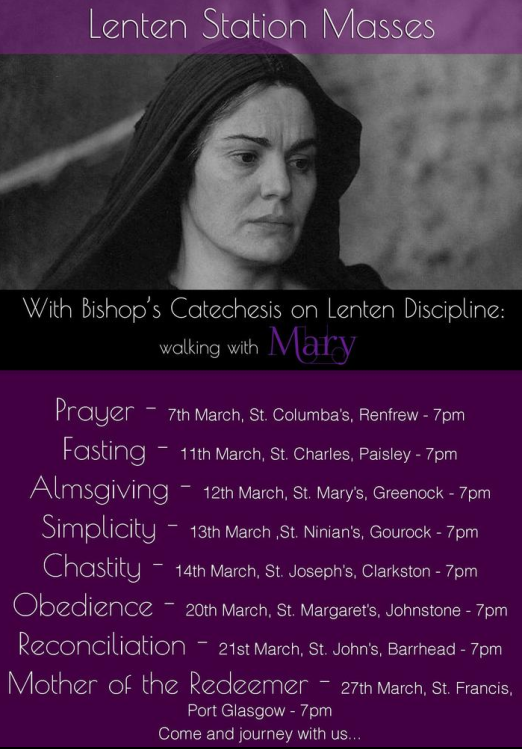 A reminder that Bishop John will be coming to our parish to celebrate a Lenten Station Mass on Thursday. Mass will be at 7.00pm. This mass is for everyone in our cluster and our parish; we would like to see as many of you there as possible! 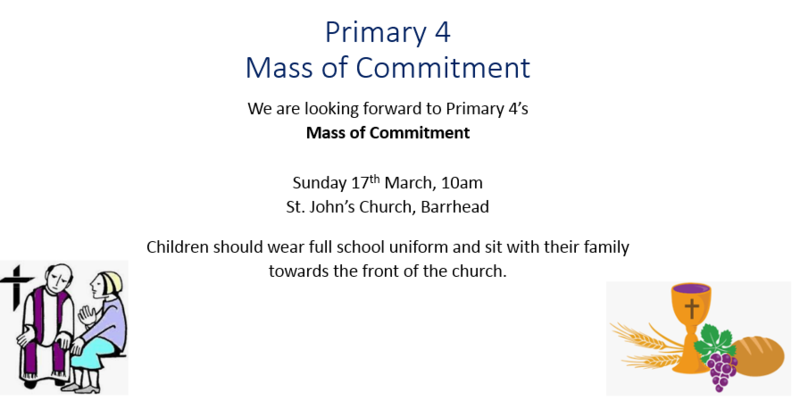 Full school uniform should be worn. 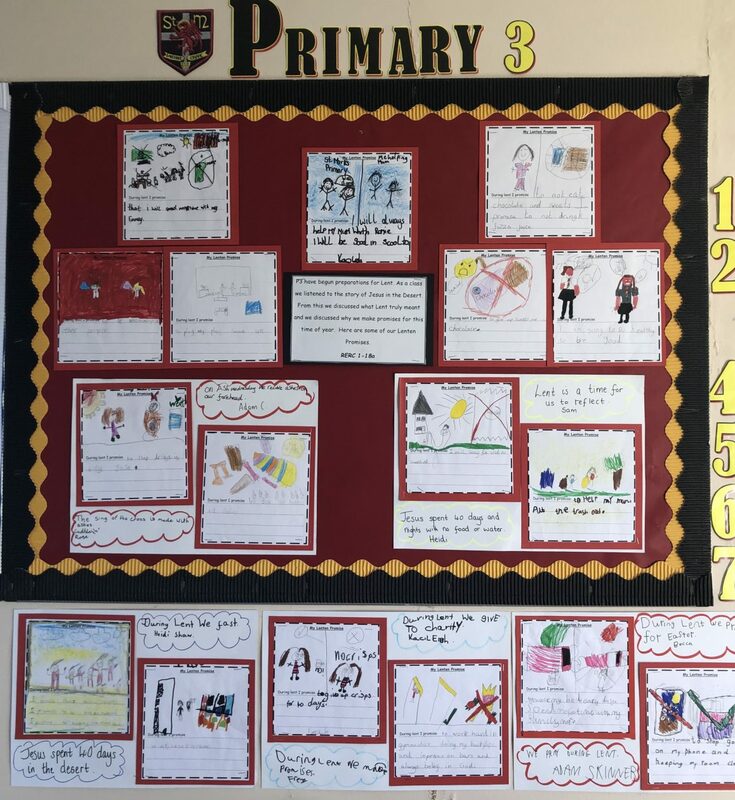 Our church display has been updated with Primary 3’s Lenten Promises. Are you wanting to help your child with their reading at home but not sure how? Mrs Guy would like to invite parents/carers to a reading recovery workshop 14th March 2-3pm in the family room where she can share some top tips to help improve reading at home. 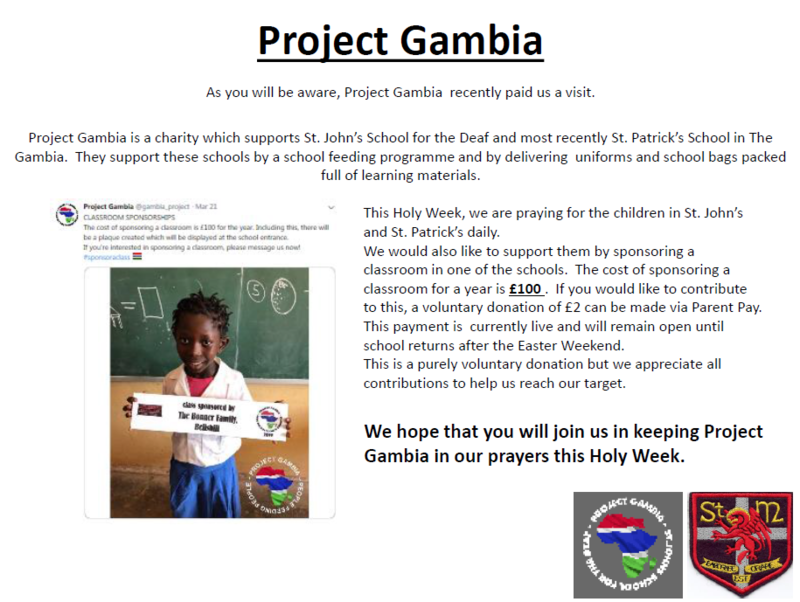 Pupils will be walking to the Foundry on Friday 15th March as part of World Book Day and if you would available to help, please complete the form above. ‘Walking Wednesdays’ will start this Wednesday 13th. Come along and meet us at St John’s Parish at 7:55am for the Lenten service at 8am. We will then walk to school and enjoy some tasty hot chocolate on arrival. Join us for a cuppa and a chat about how to keep our children happy and healthy! 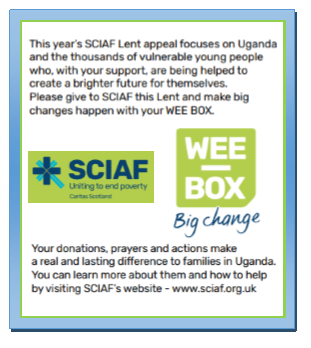 We are supporting SCIAF’s Wee Box appeal. Each class will have their own wee box. Donations are welcome. This week NDT Cycling became a Cycling Scotland Bikeability approved retailer, for more information about the BSAR scheme visit the Cycling Scotland webpage here. Good timing considering we have our next Big Bike Sale happening in Rouken Glen Park this weekend on Saturday the 9th of March from 12-3pm. All bikes on sale are fully refurbished under Revolve Standards and sold at bargain prices (typically £40- £80). Positive parenting help with Developing good bedtime routines. What does your child need from you and the adults who support them? Come and get a cup of tea, share your views and find out more about how we can work together to support children to have happy healthy minds! 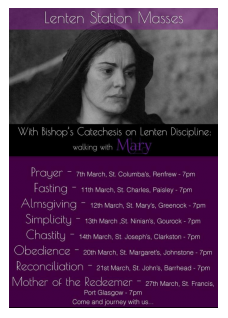 The Bishop will be celebrating a Lenten Station Mass with our cluster, Thursday 21st March, 7.00pm, St. John’s Church. We would love to celebrate this with as many families as possible. Children should wear full school uniform. A leaflet has been produced a for EU Nationals entitled ‘How to talk about Brexit with my family’. If you have any thoughts, ideas, feedback or queries you can send us a message via the email link below. Article 28: Every child has the right to an education. Primary education must be free. Secondary education must be available for every child. Discipline in schools must respect children’s dignity. Richer countries must help poorer countries achieve this.